The kidneys are a workhorse of the body, filtering nutrients from toxins. 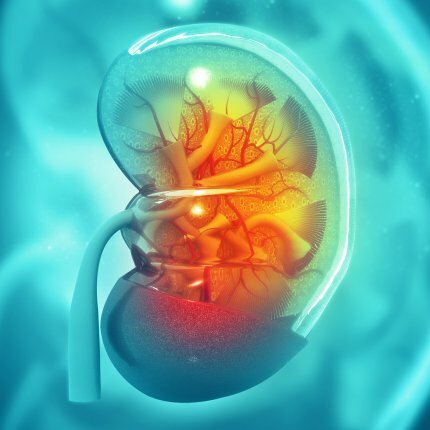 Oily cannabinoids like THC and CBD slip out of the kidneys’ filtration system, but they stop to interact with cannabinoid receptors that regulate kidney function. Researchers in British Columbia review information about cannabis use in patients with chronic kidney disease (CKD). THC appears to help manage pain, and smoking cannabis seems more powerful than taking a tinctures with equal parts CBD and THC. Cannabinoids (particularly CBDA and THCA) ameliorate nausea, but this hasn’t been demonstrated in CKD patients, specifically. And topical endocannabinoids (AEA and PEA) limited severe itching, called uremia-induced pruritus, completely eliminating the uncomfortable feeling in almost 40% of people. Unbalanced cannabinoid tone appears to play a role in chronic kidney disease, with CB1 receptors overactivated and CB2 receptors dificient. (A similar imbalance occurs in obesity and type II diabetes.) Can cannabis actually treat this underlying pathology? THCV is a minor cannabinoid that is present in large concentrations in rare cannabis strains. It gently blocks CB1 while activating CB2, and could be helpful for CKD and other conditions. But the system works in tricky ways — when THCV and CBD combine they may get in each other’s way, limiting the medical benefits. Hopefully doctors will pay attention to the possible role of cannabis in patients with kidney diseases.